THE symbols which were used in the religious teachings of early man are popularly known as the Sacred Symbols. When symbols were first used it was to concentrate man’s mind on the Infinite One, so that by keeping his eyes on the symbol no outside sights or sounds might call off his attention from the object of worship. Man was most carefully taught that the symbol itself was not to be worshipped; the symbol was only a picture to keep his mind from wandering. He was carefully taught that there was only One Deity, but that One Deity had many attributes which looked after health and strength, rain and sunshine, crops; in fact, after the whole welfare of mankind. In the beginning three symbols only were used. 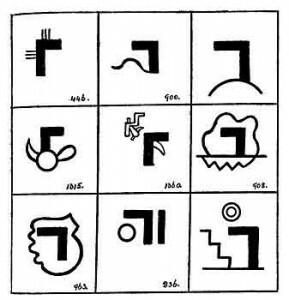 When these were understood, they were compounded and others added, and as time grew so did the number of symbols, also their complexity, until we come down to Egypt about 3,000 or 4,000 years ago, when there was such a riot of symbols scarcely one temple understood the meaning of half the symbols used in another. The three original symbols which I have referred to are: The Circle, The Equilateral Triangle and The Square. THE CIRCLE.–The Circle is a picture of the Sun and was the symbol of the Infinite One. As it embraced all of His attributes it was the Monotheistic Symbol. Being the Monotheistic Symbol it was considered the Most Sacred Symbol of all. According to legend, the Sun was selected for this symbol because it was the most powerful object that came within the sight and understanding of man at that time. The circle having no beginning and no ending also symbolized:–everlasting, without end and infinity. 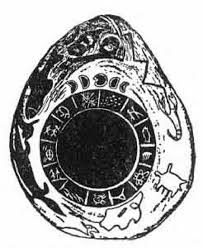 Before very long it is shown that the circle was being used to symbolize so many things that it became necessary to specialize the circle when using it as the Monotheistic Symbol of the Deity. The Nagas made an addition by placing a dot in the center of the circle. The Uighurs added a smaller circle within, making it a double circle. Papyrus Anana: This is one of the most beautiful Egyptian writings that I have come across. Anana was chief scribe and king’s companion to the gentle Seti II about 1320 B. C.
shall find in the days unborn, if your gods have given you the skill. Read, O children of the future, and learn the secrets of the past, which to you is so far away, and yet in truth so near. “Men do not live once only and then depart hence forever; they live many times in many places, though not always in this world. That between each life there is a veil of darkness. “The doors will open at last, and show us all the chambers through which our feet wandered from the beginning. “Our religion teaches us that we live on eternally. Now eternity having no end, can have had no beginning–it is a circle; therefore, if one be true, namely that we live on forever, it would seem that the other must be true also: namely, that we have always lived. “To men’s eyes God has many faces, and each one swears that the one he sees is the only true God. Yet they are all wrong, for all are true. “Our Kas, which are our spiritual selves, show them to us in various ways. Drawing from the infinite well of wisdom that is hidden in the being of every man, gives us glimpses of the truth, as they give us, who are instructed, power to work marvels. “The Spirit should not be judged by the body or the god by his house. as the Creator rolls the world around which seems to be round causing it to produce life. “All gods send their gift of love upon this earth, without which it would cease to be. My faith teaches me more clearly perhaps than yours, that life does not end with death, and therefore that love, being life’s soul, must endure while it endures. “The strength of the invisible tie will bind two souls together long after the world is dead. “The spirits or souls of one incarnation possibly may meet again in another incarnation, and may be drawn together as if by a magnet but for what cause neither knows. Various forms and modifications of the Sun as Ra are to be found in the ancient writings. Fig. 1. The Original Monotheistic Symbol of The Deity. Fig. 2. A subsequent change made by the Nagas. Fig. 3. A subsequent change made by the Uighurs. Fig. 4. Part of the headdress of some of the Egyptian gods. Fig. 5. This generally appears as a red sphere on tops of pillars and monuments to the dead. The foregoing Suns are all the Monotheistic Symbol of the Deity and among the ancients was called Ra. I will now take some pictures of the Sun appearing in ancient writings as the celestial orb and not as Ra the Monotheistic symbol. Fig. A. Is an eight-ray’d Sun. This was Mu’s symbol on her Royal Escutcheon. The name in the Motherland of the Sun as the celestial orb was–Kin. In Egypt the name was–Horus. In Greece–Apollo and in Babylonia–Belmarduk, et cetera. Fig. B. A Sun with rays all around it represented the Sun at his meridian in mid-heavens. Fig. C. A rising Sun with rays, half the orb above the horizon, was the symbol on the escutcheon of a colonial empire of Mu. Fig. D. A Sun with half the orb above the horizon without rays had a dual symbolization. It was the symbol of the setting Sun. It was also the symbol of a colony of Mu, before it became a colonial empire. Fig. F. The Sacrifice of Mu. The Lotus above is Mu’s floral symbol; being shown withered and dying it symbolizes Mu as being dead. A rayless Sun stands between Mu and the altar; therefore Mu is dead in the region of darkness–on the altar as a sacrifice. THE EQUILATERAL TRIANGLE.–The equilateral triangle has a dual significance, dependent upon where and how it is used. Its origin dates back as solving to primitive man the emersion of the three lands which formed the Land of Mu–the Lands of the West. The Lands of the West consisted of a huge continental island and two small ones, separated from the big one by narrow seas, called in the Egyptian “canals.” Tradition says that the big continental island was first emerged and that the two small islands were subsequently emerged at different periods. It was to explain this phenomenon, of the three lands coming up at different periods, that the triangle was selected. The equilateral triangle has three equal sides joined to one another and forming a single unbroken line without ends. three Creators but only one. Apparently, to make it more understandable, each was raised by a separate attribute. This formed the first Triune Godhead whereon have been built the enormous number of Pantheons that have permeated all ages. The conception of a Triune Godhead has been handed down from the beginning of religious teachings and still remains with us. An equilateral triangle symbolized the Creator, and, as the Creator dwells in Heaven, the triangle must necessarily symbolize heaven also; for, where the Lord is, there is Heaven. I find this verified among the Egyptian symbols, as the glyph shows. Here we find the Monotheistic Symbol of the Deity within the triangle-within Heaven. Wherever or whenever the equilateral triangle is met with in ancient writings or inscriptions, it is either in reference to the Triune Godhead, or Heaven, or both. THE FOUR-SIDED SQUARE.–The Four-sided Square completes the trilogy of the first and original Sacred Symbols. The square was selected as a conventional symbol of the earth for apparently two reasons:–To prevent it from being confounded with the Sun whose picture was a circle; and for the purpose of teaching to primitive man the cardinal points North, South, East and West. Being drawn as a square gave the earth “four corners” which were to be explained as teaching developed. Later the four corners became the positions of the “Four Great Pillars,” one of the many names given to the Four Great Primary Forces which emanate from the Creator. These Forces first evolved law and order out of chaos and darkness; then created the bodies of the Universe and all therein. They now continue and uphold the work that they have accomplished, hence the name of “Pillars” having been given to them. The next step was to appoint keepers for the Pillars. These were known as the Genii. Apparently, when the meanings of the foregoing three symbols were learnt by primitive man, his next lesson was the compounding of these three symbols. TRIANGLE WITH THREE STARS.–Fig 1. The triangle here symbolizes Heaven. The three stars within symbolize the three members of the Triune Godhead. The Triune Godhead dwells in Heaven. symbolizes Heaven. The five stars within symbolize the full Godhead of Five, namely, the Deity and his Four Great Primary or Creative Forces. The Deity with His Great Forces dwells in Heaven. A TRIANGLE SURMOUNTING A SQUARE. Fig. 3. This glyph is composed of the four-sided square the symbol of the earth, with the triangle symbol of Heaven surmounting it; thus showing Heaven above Earth. Above, in this case, does not refer to altitude in any way. It means: that Heaven is on a higher plane, where life is more perfect than here on earth. Thus this symbol depicts Heaven as being more perfect than earth, more blissful and happy. Mu and brought the Sacred Mysteries with them. 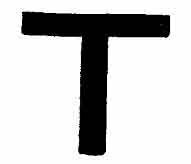 In the room where this symbol appears, the postulant received his second degree. A TRIANGLE SURMOUNTING A SQUARE AND THE TRIANGLE HAVING FIVE STARS WITHIN.–Fig. 5. As previously stated five stars symbolize the full Godhead of Five–The Deity and His Four Great Primary Forces. This symbol is to be seen on the end of the wall of the opposite room to the one previously mentioned in the Temple of Sacred Mysteries at Uxmal. Here the postulant received his third degree, and was then prepared to enter the Holy of Holies. This ends the compounding of the three original symbols. The Sacred Symbols:–The circle, triangle, square and pentagon became the foundation of the wonderful geometrical. knowledge attained in Mu and thoroughly entwined religion with science. and was found in the writings and inscriptions of all ancient lands. The emblems of mortality were used in the ancient religious ceremonies to impress upon the postulant what his end would be and the end of all mortality, and with this end in view impress upon him constantly the necessity of living a life that would bring no terrors when the soul releases itself from the body to pass into the world beyond. The Egyptian was a reflex of the Maya, and the Maya the teachings direct from the Motherland so that, from Egypt, we can get the original ceremonies with but immaterial changes. In the temple within the Great Pyramid was found in one of the chambers a sarcophagus with the emblems of mortality arranged alongside of it. The postulant was placed in the sarcophagus; here he was reminded that after his soul leaves his mortal body another life awaits him. This ceremony persists with the Freemasons today. The TAU (Ta-oo).–The Tau is not only one of the most interesting, but it is one of the most ancient symbols, as it. is found repeatedly in the oldest writings of the Motherland. It is the symbol of both resurrection and emersion. Emersion is really only a resurrection of land. I know of no country on the face of the earth today that has not been under water several times-thus each time it was emersed it was resurrected. The name today is as it was in the Motherland–Tau; it was Tau then and it is Tau today. It is one of the very few words that has persisted through all time without a change in any way. The name means “the stars which bring the water.” Ta–stars, and ha–water. The Marquesans today pronounce it “Ta-ha” (the pure Motherland pronunciation). the land with golden grain. Mu became the land of plenty. Life had been resurrected. Fig. 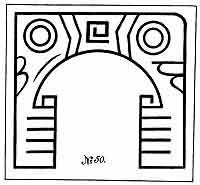 A: This is an example, showing how the Mayas often depicted the Tau as a tree, with two branches bearing flowers and fruit. Fig. B: This vignette comes from the Troano MS. It describes the arrival of the rainy season in Mayax. The figures are symbolical. I give now three cuts that show the Tau symbolizing emersion. Sacred Writings: This is a vignette from the Sacred Inspired Writings symbolizing Mu as the land emerged. Naga Vignette: Children of Mu leaving the Motherland by water, the Tau is Mu emerged. This is from a Hindu carving 2s,000 years old. by air and water. The Tau is Mu emerged. This is from a Hindu carving 25,000 years old. THE DOUBLE TRIANGLE.–A pair of triangles bound together at their base, thus forming a double triangle, was the ancient symbol for an offering, and often appeared on the altar where offerings were made. These altars were generally in the form of the Tau, or had a Tau carved on the face of the altar. The rain brought by the Tau made offerings possible. These offerings, generally, were in the form of flowers or fruit, or products from the fields. Before the destruction of Mu, sacrifices were unknown. Sacrifice was a word coined to describe the awful destruction of the beloved Motherland. The two-sided square is on many of Niven’s Mexican tablets. I am giving a page of examples. In all of these tablets they are referring to the Sacred Four as “The Great Builders of the Universe.” Down to the time of Mu’s destruction, this symbol was used only to express builders as the name of the Creative Forces. When, however, thousands of years afterwards, we enter Egypt, we find this symbol with a new vestment and a new name. Here it became the symbol of justice and uprightness. It has always been thought that this symbol originated in Egypt but it goes back thousands of years beyond the commencement of Egyptian history. The two-sided square is a symbol which is constantly found in the Book of the Dead, also in various Egyptian papyrii. All seats where either gods or goddesses are shown sitting are composed of the two-sided square. In the Great Hall of Truth where Osiris is shown sitting in judgment his seat is composed of the two-sided square. The Great Hall of Truth or Judgment Seat of Osiris. Left to right: Osiris in judgment chair. A leopard skin, his banner. Four genii over closed lotus flower, symbol of Mu. Great beast of Amenti. Thoth with Ibis head recording history of the deceased. Anubis with jackal’s head and Horus with hawk’s head weighing the heart in pair of scales against a feather. 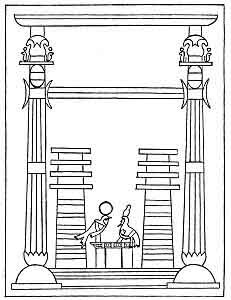 The deceased, hands aloft exposing his heart, being led into the Hall of Truth by a feather and being received by Maat, goddess of Truth. From the Egyptian “Book of the Dead,” chapter 125.
the priesthood of Egypt was the actual meaning of this symbol known. This is shown by the title and symbol of the god Ptah. Two of his titles were “The Divine Artificer” and “The Divine Builder”; accompanying these titles was the two-sided square. In all of the designs of Egyptian Pillars, they symbolize the ancient and true meaning. THE CUBE.–This symbol is especially interesting to Arch Masons. It is found in the 64th Chapter of the Book of the Dead which is the oldest and one of the most important chapters in this sacred volume, having been written by Thoth at Sais at the commencement of Egyptian history about 14,000 B. C. Translations of it vary somewhat but not materially. The following are some of the translations. brought it to the King as a wonderful object. When he saw that thing of mystery which had never been seen or looked upon.” London Papyrus dating 3733 B. C. The cube is what was found. The flight of the soul to the region of incarnation. The deceased sailing his bark through the field of stars to Amenti, the domain of Osiris, for judgment and reincarnation. diagrams. I did not find it in any of the Sacred Writings which I read, but that is no criterion, nor does it say that it does not appear in the Sacred Writings. There are over ten thousand tablets covering these writings. I have only seen about three thousand out of the ten. circles are gates, “The twelve gates to heaven.” Each gate was a virtue, and these twelve gates must be opened by the twelve virtues before heaven could be entered. Among the twelve virtues were first of all Love; then followed Faith, Hope, Charity, et cetera. THE FEATHER.–The feather is another of the very prominent Ancient Sacred Symbols; it symbolized Truth. Three feathers adorned the Crown of Mu. Three feathers were the ornament on the head piece of Ra Mu, the King High Priest of Mu–Niven’s Mexican Stone Tablet No. 1780. We find feathers as symbols among the Mayas, the difference in color denoting the rank of the wearer. In Mu yellow was the color for royalty, blue for the priesthood and red for soldiers and nobility. In these ancient times yellow appears to have been the royal color throughout the world. A dark blue is the mourning color in the Orient today. Research shows that this color was adopted when Mu was sacrificed, and corresponds with the color of her burial shroud–the blue waters of the Pacific Ocean. The feathers worn by the North American Indian today is a relic which he has inherited from his forefathers. Whether they know the original meaning of the feather, I cannot say. When on the warpath, however, they color the ends of their feathers red, corresponding with the red feathers of the soldiers and nobility of Mu. about the feather. In the early Egyptian times, as in Mu, a straight feather was used. About the time of Menes a curled ostrich feather was used on all new symbolizations. The curled feather is in the headdress of Osiris and Maat, and in the Great Hall of Truth an ostrich feather is shown as being weighed against the heart of the deceased, the feather symbolizing Truth. Legend says that the feather was selected to symbolize Truth because a puff of wind blows it away. Truth is just as liable and easy to be frightened away as the feather is to be blown away. The ancient name for the feather was Kukum, Ku or Kuk. Among the Mayas of North America we find a serpent called Kukul Khan which translated would be Khan–king, Kuk–feather, and ul–covered; so that a free translation would be: The King of Serpents which is covered with feathers. This corresponds with the Quiche Maya as recorded in their Sacred Book the Popol Vuh. Pillars as sacred symbols are of an extremely ancient origin. My personal opinion is they date back to the first temple ever erected for the worship of the Infinite One and that was more than 70,000 years ago. The Pillar is one of the multitude of symbols which symbolize the Four Great Creative Forces. They were first used at the doorway or entrance to the temple. They were specialized in their construction and shapes. From various old tablets and fallen ruins I have reconstructed a pair as they were erected 20,000 years ago. four sections, to correspond with the Four Great Primary Forces, the Four Great Gods, et cetera. THE SACRED SYMBOLS OF MU shape like the ancient glyph for Pillar. Connecting them all is shown their source, the great Creator. Temple Porch with two Pillars: Niven’s Mexican Stone Tablet No. 50, over 12,000 years old. arch, the hieratic letter H in the alphabet of Mu. This was the alphabetical symbol of the Four Creative Forces. So this temple was dedicated to the Four Great primary Forces. Below are shown two pillars, each one has four sections the numeral four (Uighur form) corresponding to the four Primary Forces. The left hand pillar is capped with the glyph strength, and the right hand one with the glyph establish. The ground plan of this temple which is on another tablet shows the left hand pillar to be square and the right hand one round. A very old written record, dating back to about 11,000 years, comes from the Greek, and refers to the pillars of the temple dedicated to Poseidon of Atlantis. 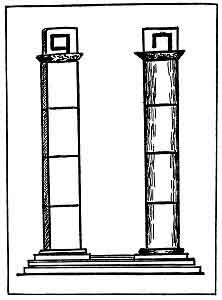 The foregoing I think clearly establishes the antiquity of pillars as sacred symbols, with their shapes and meanings. I shall now pass on to the Egyptians of much more recent time, taking the period of about 1,000, to 4,500 B. C.
brought them and between the two, new conceptions of what pillars ought to be developed. The Egyptians called them Tat Pillars. They are, however, better known throughout the world as Totem Pillars. The Egyptians called one pillar “Tat” which in their language means “in strength.” The other pillar they called “Tattu” which means “to establish,” and when conjoined, “In strength this place is established for ever.” The Egyptians considered the figure of a Tat an emblem of strength and stability. In the porch or entrance to King Solomon’s Temple two special pillars were erected. erected standing perpendicularly. In each case they have identically the same meanings, language considered, with identically the same names. Beyond this the ornamentation on the pillars–lily work–are also the same: showing that King Solomon’s pillars were a complete copy of the pillars at the Great Hall of Truth; and while both change the pattern of the pillars that they both retained their original meaning: that is, they symbolized the work of the Four Great Primary Forces. North American Indian: The Indians of our Northwestern states and of western Canada erect Totem Poles and hold ceremonies at their base. I have been unable to get anything about them except legend: but these legends and carvings on the Totem Poles strongly confirm the fact that the forefathers of those Indians came from Mu, and from that part of the Motherland where the bird was their symbol of the Creator. The Maoris of New Zealand: A common practice of the Maoris of New Zealand is to erect Totem Poles or Pillars at the main entrance to their villages. The Karangs of Java: Forbes in writing says:–“In Java is a tribe called Karangs, supposed to be the descendants of the aborigines of the island, whose old men and youths, four times a year repair secretly, in procession, to a sacred grove in a dense forest, the old men to worship, the youths to see and learn the mysteries of their forefathers. quadrilateral enclosures, the boundaries of which are marked by blocks of stone, or fixed in the ground. Here and there on the terraces are prominent monuments, erect pillars, and especially noteworthy, a pillar erect within a square. The Israelites in Egypt: While in Egypt the Israelites had two pillars of red brick at the entrance of their poor little temples. In many of their synagogues today, they erect two pillars at the entrance and say they symbolize the legendary pillars of fire and smoke that accompanied them during their exodus. What did their Egyptian Pillars symbolize? letter M in the Motherland’s alphabet. The alphabetical symbol for mother, earth, land, et cetera, or is the symbol for a pillar when the actual pillar is not shown; therefore, this glyph reads:–“The four pillars at the four corners of the earth.” The whole of this plate is a mistranslation. THE EIGHT ROADS TO HEAVEN.–The eight Roads to Heaven was a religious symbolic teaching which I first found in the Cosmogonic Diagram of Mu which attests its great antiquity. In this Cosmogonic Diagram it was used to show man how he must live on this earth to be prepared to pass into the world beyond when his call came. The eight Roads to Heaven was not an actual conception; it was a symbolic teaching, religious in character. These special teachings were unquestionably universal, as they are found among ancient people throughout the world. Such form of teaching must have been very popular since there were so many designs of symbols for it. Every ancient people appear to have had their own idea as to what design and figure best symbolized the eight Roads to Heaven. First Civilization, also carved on the stones of the North American cliff dwellers or their predecessors. The Life Symbol is a compound of two symbols. The O loop at the top symbolizes a mouth or gateway. It was from the Egyptian that the symbol of Venus, the looped cross, originated, and with its adoption a new vestment was given to it. With Venus it symbolized the triumph of the spirit over bodily matter, the soul over materialism. Venus was the Roman and Aphrodite the Greek. We find, among the Egyptian relics, that many of the symbols were very much ornamented. In the ancient writings I have only come upon plain, unornamented ones: all of the Egyptian were, however, not ornamented. As an example is the base on which the seat of Osiris rests in the Great Hall of Truth. Here it is many times repeated. Among the cliff dwellers or their predecessors, there is a tendency to curve the perpendicular member of the cross, thus , which has led many archaeologists astray, inducing them to give the glyph an erroneous meaning. THE ROADWAY OF THE SOUL.–I have found in my wanderings two figures prominently placed, but never came across the name by which they are called. As they are generally found on the outside of, and on the walls and ceilings of, burial chambers, I have given them the name as shown in the above caption. Some day perhaps their correct name may be known, then this temporary name can be abandoned. been a puzzle to me, as it has been found all along the line of the great Uighur migration. The picture I am showing comes from New Grange, County Meath, Ireland. The figure is either an explanation of the esoteric or hidden meaning of the hieratic letter N in Mu’s alphabet, or the letter itself, highly embellished, I cannot say which. After a careful study of many of the writings of Mu in which the letter N appears, I find a slight variation in them. Sometimes they are formed thus , sometimes thus . The difference is that in one the ends are left open–in the other they are closed–there are no ends. As there are no ends, the figure becomes a continuous line, returning to the starting point, and proceeding on as it can find no place to stop. It is therefore equivalent to a circle, which has no beginning or end. 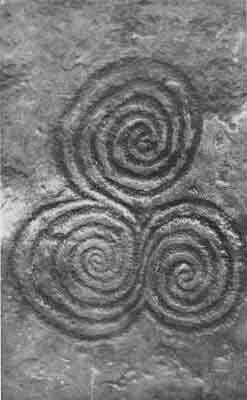 In the picture shown from New Grange it will be seen the spirals have no ends, but when the center is reached the line returns on itself. There is no starting point in either of the spirals and no end given, consequently, these spirals are also the equivalent of a circle. having no end nor beginning. These spirals have no end or beginning and are generally found, associated with the passing on of the soul, in burial chambers of the material body. A careful study of the symbol and where and under what circumstances it is found leads me to the belief that:–These hitherto unreadable spiral symbols give the hidden meaning of the hieratic letter N–Mu’s alphabet; that they are intended to depict the continuance of the soul from one cycle to another, from one incarnation to another, eventually ending whence it came. In the New Grange picture which I have shown there are three spirals all running into each other without an end. I take it that the third spiral is meant to indicate the passing of the soul into the world beyond or maybe to some other body in the Universe specially prepared to receive it. On the walls of New Grange there are carved other symbols, spirals, squares, zig-zags, et cetera. , A spiral with an end pointing to the right is an ancient Uighur symbol meaning, “going to somewhere.” It is also found in Mexico and among the North American Indians. cardinal points and in reference to the Four Pillars. A square within a square placed on end symbolizes that something has gone from it. A zig-zag or herring-bone with the points defined is the universal ancient symbol for a tank fire, an abyss of molten fire without flames, prominent in Egyptian symbology. All these glyphs are on the stones of New Grange. I would not attempt to write a legend without seeing the stones personally. No draughtsman ever draws these ancient figures as they are identically shown on the stones. This has been my experience. Consequently no reading, or possibly an erroneous reading, would be made. These also are generally found at the entrance of burial chambers. THE TREE AND THE SERPENT.–This work would seem incomplete to me if I omitted the Tree and the Serpent. 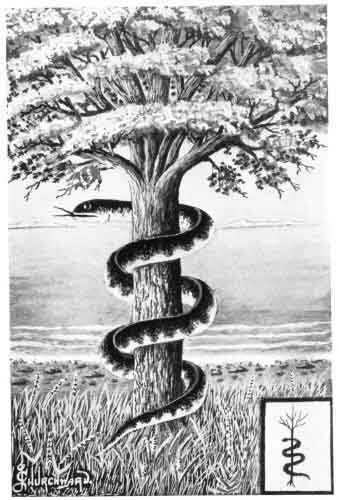 Innumerable legends about the Serpent and the Tree are found in religions. The tree is invariably called “Tree of Life,” and the serpent entwining it, “Tempter,” or whatever else signifies Satan. The Tree and the Serpent started as a legend, then gradually drifted into myths: the climax being reached when the tree was credited with its fantastic crop of apples. These apples became necessary to carry out a myth for how otherwise could old Satan tempt Eve to eat apples and Eve tempt Adam? They were needed to accomplish the downfall of Adam. By this action poor woman has been made the cause of every ill befalling mankind. It is a monumental piece of cowardice on the part of man to put that responsibility on the shoulders of the woman. The irony is that a man and not a woman was to blame. The Eve alibi has stood for nearly 3,000 years but it must now be set aside. Had Ezra been able to read correctly the symbols which appeared in the writings of Moses, he would have given a very different version of the wily old Serpent and the Tree of Life. 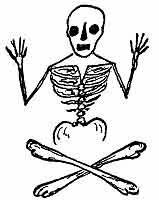 material body was only a temporary habitation. All other forms which are known to us as life are of a temporary nature also. They are taken from the earth and to earth they must return. Of all the forms of earthly creations, man only had an imperishable part which survived the material body and lived on for ever; therefore Man’s Soul was the only true life on earth. Man first appeared on earth in the Land of Mu; therefore the first actual life on earth appeared in Mu. In these writings man is also spoken of as a fruit. Trees bear fruit, and man was the first fruit of a tree and the fruit was life. The Land of Mu was the Tree of Life. Thus Mu was symbolized as a tree–the Tree of Life. 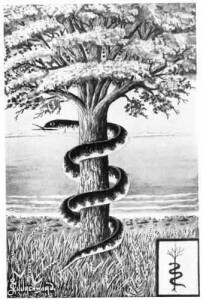 In the vignette, the tree is shown as having a serpent coiled around it, thus surrounding the tree. It is an unadorned serpent, therefore it is Khan the symbol of Khanab, “The Great Waters,” the ocean. Here it is symbolically shown that Mu was surrounded by water. Mu had no land connections with any other continental land. The Serpent is the waters surrounding Mu. The foregoing shows and intelligently explains what the Tree of Life was, and why a Serpent is coiled around it. What Moses undoubtedly wrote were plain facts, in symbolical language–a symbolically written history, true in all respects. Translations, erroneous and misleading, perverted his writings. THE ANCIENT MEANINGS OF CERTAIN NUMERALS.–The number 3 is now commonly called the lucky number. Why? We must go back to tradition to tell us. THE SACRED SEVEN.–The original sacred Seven was the Seven Great Commands of the Creator. These were given to the Four Great Primary Forces, to carry out “his will, command or wishes,” thus emanating from the Creator. They are the Creative Forces of the Almighty. The predilection of ancient peoples in their sacred ceremonies for the use of the numeral Seven is very great and conspicuous. Hindu: The Seven Days of the prophecy of the Flood made by Vishnu to Satyravata. The Bible: The Seven Days of the prophecy of the Flood made by the Lord to Noah. Babylonian: The Seven Vases used by the priests in their sacrifices. Persian: The Seven Horses of the Aryans, that drew the chariot of the Sun. The Seven Apris or shapes of the flame. The Seven Rays of Agni. Hindu: The Seven Steps of Buddha at his birth. The Seven Rishi Cities of India. Egyptian: Their Seven Days of Creation. Their Seven Days of the week. And the Seven Classes of Egyptians. Greek: The Seven Islands sacred to Proserpine. The Seven-headed Hydra killed by Hercules. Norse: The Seven Families who accompanied the mythical Wotan, founder of the city of Nachan. Hebrew: The Seven Lamps of the Ark. The Seven Branches of the Golden Candlestick. The Seven Days’ Feast of the dedication. The Seven Years of plenty. And the Seven Years of famine. The Seven People who escaped from the flood. Christians: The Seven Golden Candlesticks. The Seven Churches with the Seven Angels at their head. The Seven Heads of the beasts that rose from the sea. The Seven Seals of the Book. The Seven Trumpets of the angels. The Seven Vials of the wrath of God. The Seven Last Plagues of the Apocalypse. Nahualts: The Seven Caves from which the ancestors of the Nahualts emerged. Zuni Indians: The Seven Cities of Cibola. Uighurs: The Seven Sacred cities of the Uighurs. Atlantis: The Seven Great Cities of Atlantis. The Seven Marouts or genii of the winds in the hierarchy of Mazdeism. The Seven Rounds of the ladder in the cave of Mirtha. Mu, the Motherland: The Seven Sacred Cities with their golden gates. 10. Lahun. Lahun. He is two in one. The ancients counted in fives to avoid mentioning ten. Ten was the numeral of the Deity; therefore too sacred to be mentioned. Ten was counted twice five, fifteen three times five and so on up to twenty. I will take one more example in numerals–the number 13. Thirteen is always looked upon as unlucky especially when in connection with Friday. Mu, the Motherland, was destroyed on a Friday, the 13th day of the Month of Zac (the white month). The memory of that day, the 13th, has been carried down as an unlucky day for mankind.